Make your own dryer sheets: Three easy methods that rock! 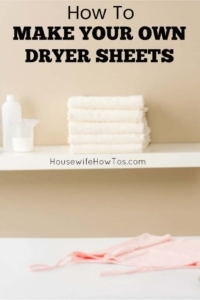 Knowing how to make your own dryer sheets will save you a considerable amount of money. Plus, if you’re an allergy sufferer like me, your sinuses will thank you. What could be easier than grabbing a dryer sheet, popping it in with your damp clothes, and letting it do its thing? Unfortunately, “doing its thing” also means wasting your money. Depending on what type of dryer sheets you use, its “thing” might also irritate your allergies and skin. While a small study indicates that scented dryer sheets may cause cancer, this has been highly disputed. Other sources claim that the petroleum-based chemicals on dryer sheets can harm your dryer by leaving behind a residue that clogs your lint filter and reduces efficiency. Over time, that buildup can also cause house fires. If you or a family member has eczema or, like me, suffers from psoriasis, you may find that dryer sheets make such skin problems even worse. That’s particularly true for babies or those with suppressed immune systems. One thing is sure, though: since dryer sheets aren’t biodegradable, they add to landfills. They can also be harmful to pets, which seem to be fascinated by their texture. The solution? Make your own dryer sheets. It’s easy, it saves money, and, depending on which of the methods below that you use, it may reduce your allergy or skin issues, too. Vinegar is a fantastic laundry aid. Although it has quite a pong straight out of the bottle, the odor disappears as it dries, so there’s no worry your clothes will come out smelling like you’re wearing a salad. Fill a container with white vinegar and add a few drops of your favorite essential oil (optional). Since this is straight vinegar, which is highly acidic, be sure to choose a non-metallic container and lid. Cut an old sheet or t-shirt in squares and stuff them in the jar with the vinegar. Shake well, so the squares get fully saturated. To use, just grab a square — don’t wring it out — and pop it into the dryer with your clothes. Return the squares to the container of vinegar after each use. Add more vinegar and essential oils as needed to keep the jar topped off. If you’re trying to avoid unknown chemicals, you’ll want to use an organic conditioner that’s free of parabens, sulfates, dimethicone, synthetic fragrances, and artificial preservatives. I’ve had great luck using this Dr. Bronner’s Conditioner and Styling Cream, which smells amazing, too. Combine 3 parts hair conditioner with 1 part white vinegar in a jar and shake well. Cut up an old sheet or t-shirt into 4×4-inch squares and stuff them in the jar, then shake again. Remove the squares from the jar, wring them out, and let them completely air dry. Store the dried squares in a clean, empty jar or another kind of container. To use, toss a square into the dryer with your clothes. Each square lasts up to three loads. Save the used squares to make your next batch. If you aren’t concerned about the ingredients in fabric softener, this method is far less expensive than dryer sheets and leads to less disposable waste. Cut 6×6″ squares from an old towel or use old washcloths for this method. Flannel baby wipes are wonderful for this purpose. Put 12 squares in a large bowl and add 1 cup of fabric softener. Using your hands or a spoon, work the fabric softener into the cloths until they’re fully saturated. Remove cloths one at a time, lightly squeezing them to wring out excess softener, and hang them from a laundry line to dry. Store the dried cloths in an open container. 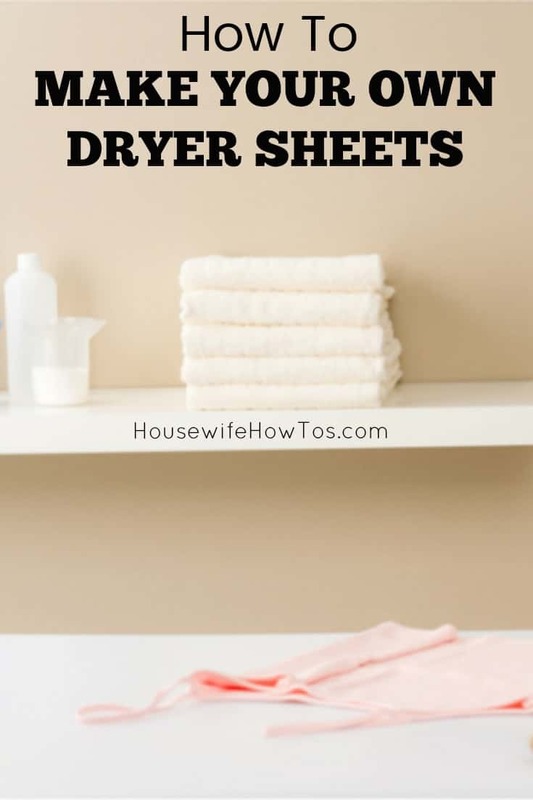 To use, just toss a cloth into the dryer with your clothes and it’ll work just as well as a dryer sheet. Bonus: you can re-use the same cloth for 10-12 loads. To make more, run your used cloths through the laundry using hot water to wash and rinse, then repeat the instructions above. you so much, I will get started. I’ve read that you should wring out the excess liquid as not to get spots on clothes and others have said do not wring out. Anyone who actually uses this on a regular basis have a suggestion for me? With the vinegar-based one there’s no need to wring out and, in fact, it’ll work better if you don’t. When I’ve used the other two, I wring them out for the exact reason you mention — to avoid spots from excess — but also to make a batch last even longer. I was wondering if the dryer sheet with the vinegar on it will help to reduce static cling. I don’t use dryer sheets at all, so I wouldn’t know. But the cloth with vinegar on it does cut static considerably. I stopped using fabric softener over a year ago and made some dryer balls out of wool yarn instead. They work great and if you want a little fragrance the essential oil and vinegar spritz will work just as well on the dryer ball. I just make sure that I leave them in the dryer when I take out a load and voila! Always ready to go. Wool dryer balls are amazing things! what a smart idea! i love making as much of our household stuff as possible myself, so i’ll definitely have to try this! Thanks for sharing these tips! I didn’t realize the issues with dryer sheets until today. And I’ll certainly enjoy spending less money! Isn’t it funny how many household products we buy that don’t just waste our money, but actively harm our stuff? I haven’t used commercial fabric softener of any kind (liquid or dryer sheet) for a long time. Many years ago, my washer repair man told me that the liquid fabric softener gunks up your washer, causing the parts to wear out faster. He said it’s one of the worst things you can put in to your washer and that dryer sheets are better. Well, sheets are better, but they still are not that great. I make my own ‘fabric softener using hair conditioner (preferably organic), vinegar and a spray bottle. I mix it together and spray three or four times onto the clothes before they go into the dryer. (You could use an old t-shirt, too) if you don’t want to spray on the clothes. Works like a charm, my clothes smell great and no build-up on the machines or in my clothes. Your washer repair man is right, but hair conditioner has many of the same surfactants in it as the dryer sheets or liquid fabric softener. Except the organic kind… and they have their own oils they’re depositing. Have a great weekend coming your way and wish you both well. My mom’s a dryer sheet addict, despite all of her kids warning her about how bad they are for her laundry machines. Guess what she just had to replace last week, after only 3 years of use? I have to wash my lint screen every couple of weeks, even without using dryer sheets. Our washer/dryer set is 10+ years old — and definitely due for replacement — so the screen doesn’t clean as easily as it used to.